It’s taken a bit more than a week, but I think I’m mostly over whatever bug had hold of me. It’s been a long time since I’ve been knocked as flat by a cold/flu/whatever as I was this time. So apologies for the sparsity and possibly incomprehensibility of what posts I did manage to get up. I’d like to take a couple of moments to talk about Knights in Tarnished Armor by Kate Paulk that will be coming out over the weekend. Some of you may know Kate from Baen’s Bar or any of the other discussion boards she takes part in. To say Kate has an interesting sense of humor is to put it mildly. She manages to take the ordinary, twist it in a mixture of Aussie irreverence and American cynicism and come out with something unexpected. That’s exactly what she’s done with KITA. When I was trying to describe it briefly yesterday, my first thought was it’s a comedy of errors. In many ways, that’s exactly what it is. But it is also a comedy of LETTERS, because the action is all revealed through a series of letters between our not so shining knights and their all too willing and frustrated maidens. Throw in disapproving parents, a dragon and all too many schemes and, well, you have Knights in Tarnished Armor. If you’d like to see more of Kate’s work, check out Born in Blood and Hell of a Job. Born in Blood is a novella that basically sets the stage for her novel, Impaler, that will be coming out next year. 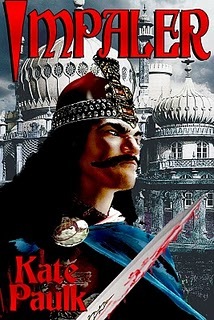 If you are interested in a new take on the history and mythology surrounding Vlad Dracul, check out both of these titles. In the short story Hell of a Job, Kate gives us a refreshing look at what might happen if a scheming woman who really doesn’t approve of the decor in the underworld becomes a Dark Lord and sets her cap on higher office. Both Born in Blood and Hell of a Job are available at our webstore, simply follow the links above, or at Amazon or Barnes & Noble. You can also find them at Smashwords. Most of all, anything you buy from Naked Reader Press is DRM-free.